Sodium Perborates | BELINKA PERKEMIJA d.o.o. Sodium perborates serve as a source of active oxygen. It is inorganic peroxide, odorless, water-soluble chemical compound prepared in a form of MONOHYDRATE (NaBO3·H2O) or TETRAHYDRATE (NaBO3·4H2O). 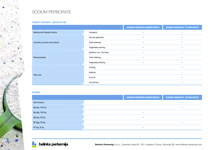 Belinka Perkemija produces both forms of sodium perborate. 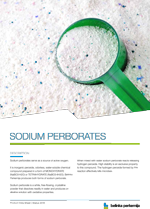 Sodium perborate is a white, free-flowing, crystalline powder that dissolves readily in water and produces an alkaline solution with oxidative properties. Monohydrate has AVOX minimum 15 % and is used for low temperature wash, but on contrary Tetrahydrate has AVOX minimum 10 % only. The monohydrated form has further on higher heat stability and a higher dissolution rate into water.